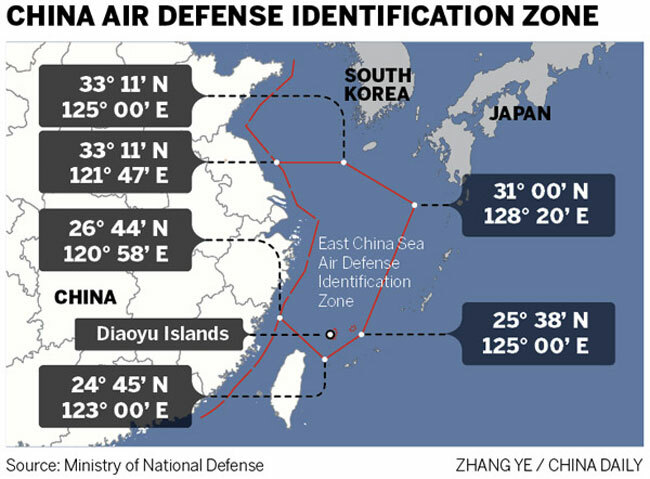 The boundaries of the new air defense identification declared by China November 23, 2013. 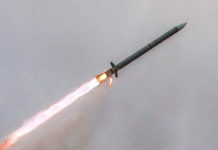 [/ismember]What began two weeks ago as a unilateral declaration of an ‘Air Defense Identification Zone’ (ADIZ) east of the Chinese mainland coast, developed into a regional conflict involving military forces and civilian airlines, struggling to claim national hegemony over disputed territories in the East and South China Seas. On Saturday, November 23 the People’s Republic of China (PRC) Ministry of National Defense (MND) announced the creation of the East China Sea Air Defense Identification Zone. The announcement outlined the Aircraft Identification Rules for the ADIZ, which include a warning that “defensive emergency measures” would be adopted to respond to aircraft that refuse to follow the instructions. The zone overlaps the existing ADIZ of Japan, South Korea, and Taiwan. 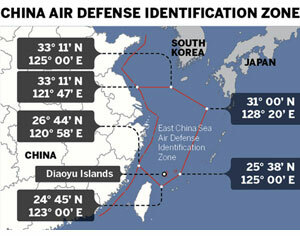 China’s ADIZ covers the disputed Senkaku / Diaoyu Islets claimed by China, Japan, and Taiwan. To enforce its claim China launched two aerial patrols over the area on Sunday 24th, involving Tu-154 and Y-8 aircraft, prompting the Japan Self-Defense Air Force to send F-15 fighter jets to intercept them. The Chinese announcement alarmed the neighboring countries and the US, which maintains significant air and naval presence in the area, particularly from its nearby air and naval base in Okinawa, Japan. Taiwan and South Korea have also expressed outrage over China’s decision. South Korea is planning to follow Beijing and establish its own ADIZ in the East China Sea, Yonhap News Agency reported. government officials said Seoul will notify neighboring countries of the details this week before making a formal announcement. “What China announced is far more provocative and dangerous because it interjects a Chinese military function in an area that the United States has pledged to defend from attack under Article V of the US-Japan Security Treaty,” explained Mike Green, senior vice president for Asia and Japan Chair at CSIS. “This is a slap at the United States now, and not just Japan.” Green added saying this is part of a larger Chinese strategy beyond territorial disputes over Senkaku. “This should be viewed as part of a Chinese effort to assert greater denial capacity and eventual pre-eminence over the First Island Chain,” Green said. Three days later the US Air Force decided to challenge the Chinese claim, sending two unarmed B-52H bombers from their base in Guam into the South China Sea. The U.S. planes spent less than an hour in the China-claimed zone, on a mission claimed as part of an annual training exercise. China’s defense ministry spokesman Geng Yansheng confirmed the US aircraft flew south and north along the eastern border of the East China Sea Air Defense Identification Zone from 11:00 a.m. to 1:22 p.m. Tuesday, about 200 km to the east of the Diaoyu Islands. 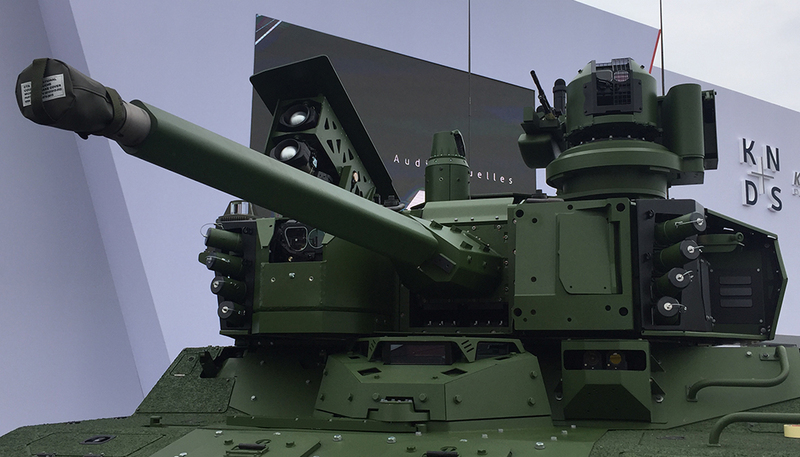 Geng said the Chinese army monitored the entire process, carried out identification in a timely manner, and ascertained the type of aircraft. US sources said the bombers did not establish any contact with the Chinese authorities on that flight. 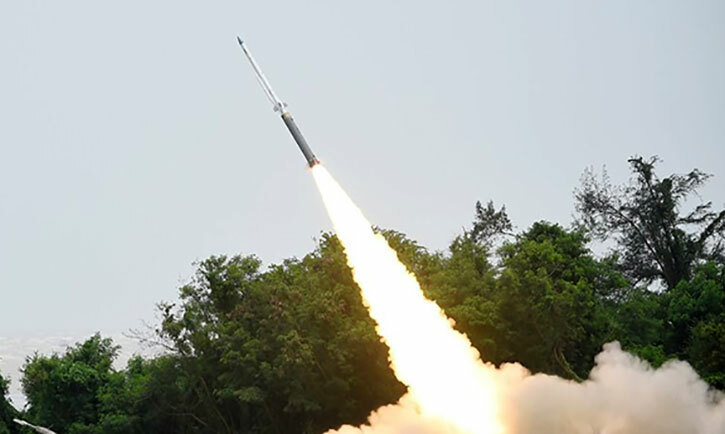 “We need to stress that China will identify every aircraft flying in the air defense identification zone according to the country’s announcement of aircraft identification rules for the air defense identification zone,” Geng said. “China is capable of exercising effective control over this airspace,” he added. A week later the South Korea’s Navy conducted air and sea drills near Ieodo Rock. The task force included an Aegis destroyer and two P-3C maritime patrol aircraft. The P-3s crossed into Japan’s ADIZ with the prior approval of Tokyo while the destroyer anchored near Leodo. This fact suggests that South Korea and Japan are boosting their cooperation in the wake of China unilaterally declaring the East China Sea ADIZ two weekends ago. 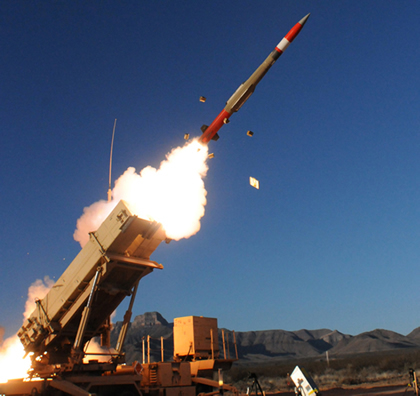 [ismember]An ADIZ is often established by a coastal nations beyond their territorial airspace, enhancing the country’s early warning coverage by reaching out farther beyond its airspace, to identify aircraft flying near its borders, verifying their identity and intentions before they get closer to the defended airspace. An enforcement of ADIZ does not affect normal flights and access to airspace, or pose any threat to neighboring countries. Nevertheless, it has a potential effect in disputed situations, demonstrating the sovereign nations’ interest over an the disputed area. It could also restrict military activity in areas regularly referred to as international domains. Along with the creation of the zone in the East China Sea, the Chinese defense ministry released a set of aircraft identification rules that must be followed by all planes entering the area, under penalty of intervention by the military. According to the Chinese announcement aircraft are expected to provide their flight plan, clearly mark their nationality, and maintain two-way radio communication allowing them to “respond in a timely and accurate manner to the identification inquiries” from Chinese authorities. The Chinese announced they will “adopt defensive emergency measures to respond to aircraft that do not cooperate in the identification or refuse to follow the instructions”. Part of the disputed airspace is controlled by Japan. The area is bordered South Korea in the north and by China’s rival Taiwan in the south. 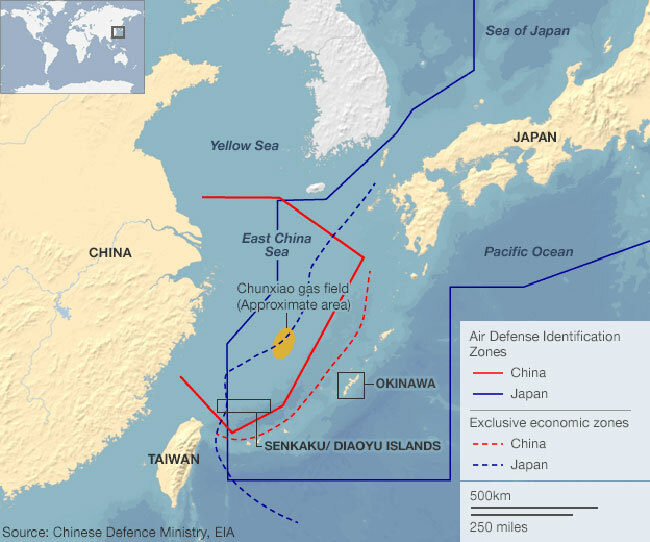 The Chinese claimed controlled airspace borders the Japanese island of Okinawa, where the US maintains a large military force. Japan nationalized three of the Senkaku archipelago’s five islands in September 2012. Since that time, China has sent regular coast guard patrols to the islands. 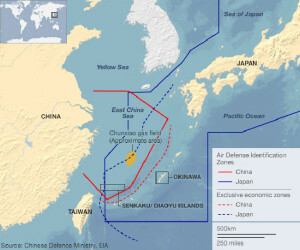 China referred to the enforcement of the ADIZ as a response to Japan’s decision to expand its own ADIZ in 2010, which also covered territories claimed by the Chinese. The new ADIZ covers the Socotra Rock (Ieodo or Parangdo), which is under South Korean control, but also claimed by China as the Suyan Rock.